The Lunar New Year is China’s most important holiday. The celebration started a long time ago when it is said that a monster named Nian (pronounced “NEE-ahn”) attacked Chinese villages. People scared Nian away with loud noises, fire, the color red, and lanterns. The defeat of Nian became a reason to celebrate the Lunar New Year. According to the Chinese calendar, each year is represented by an animal: ox, tiger, rabbit, dragon, snake, horse, ram, monkey, rooster, dog, pig, or rat. These animals comprise the Chinese zodiac and have unique traits attributed to them. Some believe that people embody the same traits as the animals that symbolize the years in which they were born. 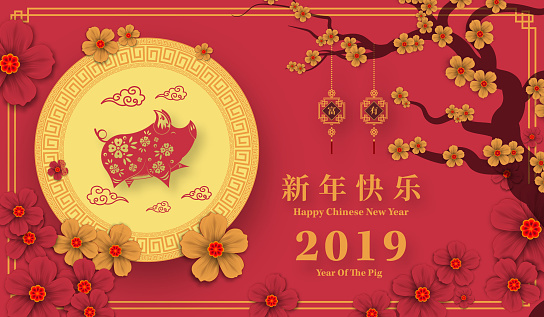 This year is the Year of the Pig or Zhū (pronounced “joo”), an animal that symbolizes wealth. People born during the Year of the Pig are believed to be logical and kind, among other things. Children in your setting will enjoy celebrating the Lunar New Year and learning about customs unique to Chinese culture. In addition to the Suggested Activities, talk with families to learn more about their customs, and invite those who celebrate the holiday to share their traditions with the children. Rotate or set out new toys. 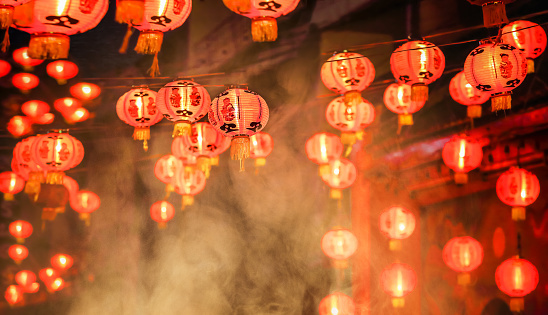 Since the Lunar New Year is marked by the beginning of spring and the ritual of cleaning, begin your celebration by changing up your classroom. Talk with the children about areas of the room they would like to change. Bring out toys, games, and art materials that have not been used or offered this year. Ask the children which items interest them. Invite the children to help you rearrange your centers or play areas and set out the new items. Make red envelopes and lanterns. As the story goes, villagers scared away Nian by making loud noises and fires, showing the color red, and lighting lanterns. Help children understand the importance of some of these elements by making red envelopes and paper lanterns. In Chinese culture, red symbolizes good luck, and during the new year, children receive monetary gifts from relatives in red envelopes. (The color red is also prominently displayed in other ways, especially in clothing and decorations.) Use this to help the children make and decorate red envelopes. Each card is decorated with the Chinese character Fú (pronounced “foo”), which means “good luck.” You can learn how to make the character here. If you are uncertain about writing the character, you can print a clip art version for children to glue to their envelopes or simply write “Good luck” on them. Light was used to frighten Nian away, so lanterns are also important to the holiday. The Lantern Festival signifies the closing of the Lunar New Year celebration. During this event, families spend time together watching performances, sharing meals, and observing lantern displays. Use this template to help children create lanterns. Depending on the ages of the children in your setting, consider helping them write riddles on their lanterns to share with the group. It is common for children (and adults) to engage in this type of play during the Lantern Festival. When children are finished making their envelopes and lanterns, you can send them home, display them, or create a space for them in your dramatic play area. Set out toy money and other props for children to “exchange” gifts, “prepare” meals as a family, or host their own Lantern Festival. See below for suggested visual media to support children’s understanding of the festival. Bang on drums. Again, in an effort to chase away Nian, villagers made loud noises, so drum performances are essential to Lunar New Year celebrations. Set up different drumming stations in your classroom or play area. Offer traditional drums, different size pots and pans, and wooden and cardboard boxes. Provide drumsticks and a variety of utensils to help children explore the sounds they make on the drums. Additionally, children can use their hands to play the different drums. Talk with children about what they hear and how the sound varies. Celebrate with homemade confetti launchers. Make more noise by making confetti launchers. Decorate clean push-up ice cream tubes with construction paper, stickers, or other art materials. Make sure the pushing mechanism is lowered and fill the tube with confetti (sequins or small pom poms are also an option). Stand as a group and count to five or backwards from five (click here if you’d like to try it in Mandarin, the most widely spoken of Chinese dialects). When you get to the last number, have everyone push the confetti through their tubes. Note: Wherever you decide to launch the confetti, be sure to cover the floor/ground with a large disposable tablecloth for easy cleanup. Sample fruits. Like any holiday, the Lunar New Year is celebrated by eating special foods. Many fruits have symbolic meanings in Chinese culture. For example, persimmons are popular during the Lunar New Year, as are oranges, peaches, and grapes. Each of these fruits represents wealth, abundance, and prosperity in some way. Other fruits to consider are pomegranates, kumquats, and dragon fruit. Have a fruit tasting party during which children observe, taste, and talk about each type of fruit. At the end, poll the group on their favorite/least favorite fruits and graph the results. Learn about the lion and dragon dances. Both animals are significant in Chinese culture; the lion represents strength (and according to some accounts, a lion chased Nian away) and the dragon represents power. Generally, the lion dance is performed by two people wearing a lion costume, while the dragon dance can require up to 100 people who each hold a pole that has part of the dragon’s body attached. See below for visual media of the lion and dragon dances to share with the children. You can talk with them about what they observe and attempt making your own lion and dragon props to dance with if time permits. Please screen all visual media before sharing it with the children in your setting to ensure that the content is age appropriate. If you are not able to share videos with the children, consider printing and showing the provided images.